While we might not necessarily have the budget or lifestyle of a royal (though we totally love to imagine we’re having high tea with the Queen Elizabeth or hanging out with Duchess Meghan) we can certainly try to dress like one. While many of the royals’ most covetable looks are high-end and designer (and therefore unaffordable) every time we spot them wearing something that doesn’t eat up the entirety of our paychecks, we take notice. It’s a good thing both Duchess Kate and her sister-in-law both love a good affordable moment: From the Duchess of Sussex’s H&M maternity dress to Kate’s Superga kicks, the duchesses sure know how to shop high-low. Luckily for us and our wallets, one of Duchess Kate’s go-to brands, L.K. Bennett, is having a huge sale. The brand is responsible for some of the Duchess’ most iconic looks, plus it’s also one of her go-to brands for footwear, and she’s worn styles from the label countless times. As for the sale? We’re talking massive discounts — 50 percent off and more. There’s even an additional 20 percent off on top of that — but we promise we’ll get to it later. Since the Duchess loves L.K. Bennett footwear, we knew we had to invest in our very own pair! Looks like it won’t be much of an investment after all — the pair we’re fawning over is just over $100! The L.K. 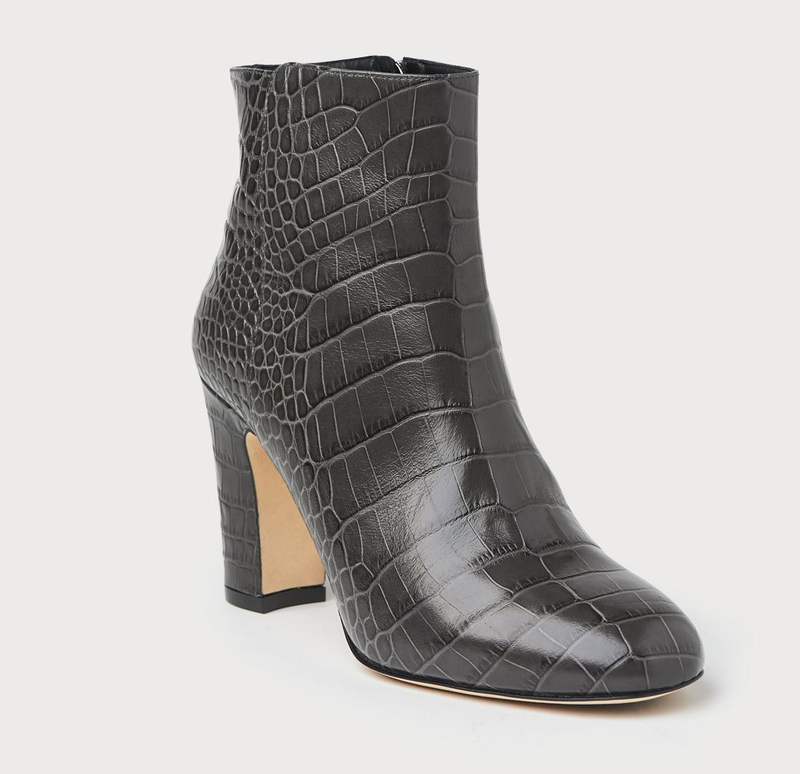 Bennett Ayla Grey Croc Effect Ankle Boots are designed to be as versatile as they are stylish. The boots are cut into a slim silhouette, creating the illusion of narrower feet and elongating the leg. They feature an almond toe, which doesn’t squish the feet like a pointed-toe, but still creates a slimming effect. It also makes them that much more comfortable! The heel is designed to give height while still being walkable. At only three and a half inches, it gives a little boost, but the block heel isn’t going to make us want to tear these off at the end of the day. They’re the perfect height for a relaxed stroll or to wear to a meeting, though we don’t recommend walking miles in them. Not a fan of high heels at all? Make like Kate and wear these for a photo opp (no one has to know). Animal prints have been one of the biggest trends to come out all winter and these are a subtler way of paying homage to a print beloved by fashionistas. If snakeskin and leopard print are intimidating or don’t work with the other items in our closet, croc-effect leather is a great way to add a playful bit of texture while still being versatile enough to team with other prints and bright colors. While it might not necessarily feel like it, spring is just around the corner (we hope — once we get out of these subzero temps), and these are perfect for wearing well into the upcoming season. They’re a deep grey, which lends a hint of color to winter go-to shades black and navy, though they would still be great with A-line midiskirts and florals come warmer weather. Not sure how to style the fashion-forward design? Try teaming with wool culottes and a crisp button-down for meetings and any time we have to dress a touch more formal. We also stand by these as the perfect shoes to wear on an interview — they give just a hint of personality, while still looking professional and oh-so-chic. Want to dress them down? Try these with distressed straight-leg jeans, and a favorite sweatshirt while it’s still cold, though they will look just as cool with a T-shirt or a floral dress once it warms up. If channeling a Duchess is on the agenda, try these with a flouncy mididress and a bouncy blowout for a truly Kate-approved look. The boots (which, by the way, are made in Italy, for all fashionistas curious about where their soon-to-be favorite fashion finds) have an upper that’s made entirely of buttery soft leather. The sole is made of durable TPU. The absolute best part, however, has to be the price! While formerly nearly $500, these are now marked down nearly 70 percent off the original price. The additional 20 percent off brings the final price down to under $120. 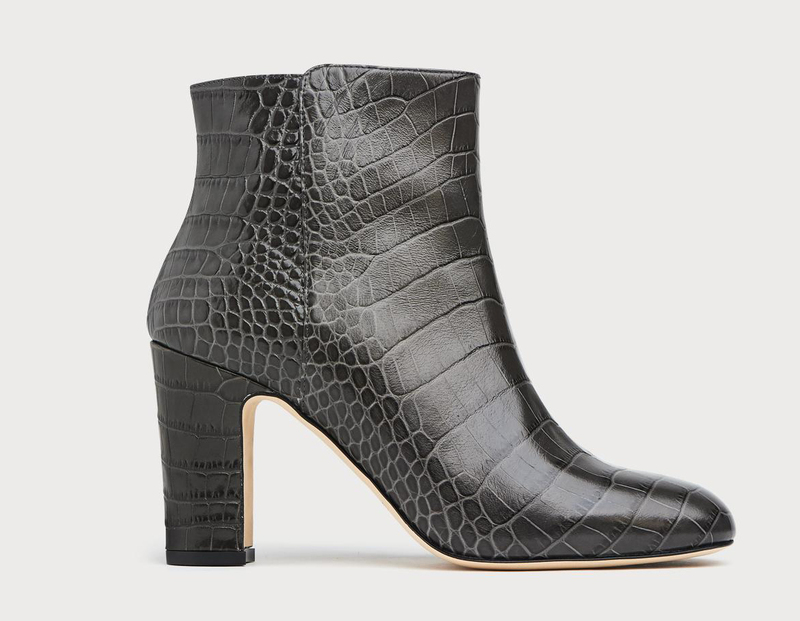 See it: Check out the Ayla Grey Croc Effect Ankle Boots (originally $495) for just $119 at L.K. Bennett. Additional 20 percent off reflected in cart (no code needed!) Looking for more shoes on sale? Check out other shoes, dresses and more styles marked down at L.K. Bennett!